Take a Tour Around Bazalgate and win a Kindle Paperwhite! To celebrate the Kindle First digital launch of TICKER, the Farthing family would like to loan you your very own Vitesse motorized high-wheeled bicycle and messenger bag. Venture out into the city of Bazalgate to see the sights and retrieve six items necessary to celebrate with Penny and her friends. When you are done, remit the list for a chance to win your very own Kindle Paperwhite customized with the TICKER cover! Contest open to US residents. 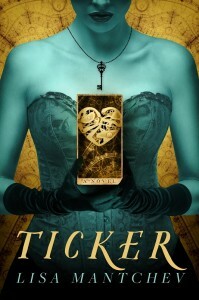 Email entries to lisa@lisamantchev.com with the subject line “TICKER Paperwhite Giveaway”. Deadline for entry is midnight PST on November 15th. Winner will be announced here on November 16th. Contest closed. Thank you and good luck to all who entered! Let the adventure begin, as it always does, with cake! Altering course, I shot straight down to the River Aire, where a left turn put me on The Strand. The air here was heavy with river damp, yeast, and steam. The other factories on the cheap oakley sunglasses block were thin gentlemen in severe black coats and top hats, smoke curling from chimneys like cigars stood on end. SugarWerks was the sole lady among them. Her striped awnings were like skirts snapping in a breeze perfumed with spices and bread; her welcoming illumination glinted off delicate ornamentation of copper and brass. Can’t wait another second to read TICKER?